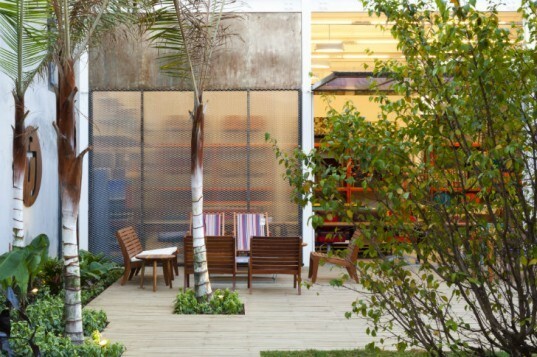 Fernando Jaeger's new retail store in São Paulo is much like the furniture he makes: handcrafted, colorful, and cheery. Renovated from an old home, the store is an eclectic mix of history and raw materials surrounded by lush vegetation. SuperLimão Studio handled the renovation and was careful to preserve many parts of the home. They reused many existing elements to create a more open and light-filled space, all while respecting the vernacular the surrounding neighborhood. Brazilian furniture designer Fernando Jaeger creates modern, functional pieces using local materials, traditional craft and reforested wood out of São Paulo. He has a number of stores in and around the area, but his newest store in Pompeii offers ready-to-ship items in a cheerful spot created out of an old home where two sisters used to live. When they sold their home to Jaeger, they made him promise not to change the architecture of the home and not to cut down the beautiful jaboticaba tree. SuperLimão designed the would open the space to make it suitable as a retail shop without compromising the history or character of the site. The brick home featured unique arcs, large windows and wood frame work, which were retained and highlighted in the new design. Roof tiles were reuse when the roof was reconstructed, the original floor was kept. Several floor beams were also used as columns to support the roof and open up some of the rooms. Any brick taken out was reused in the new warehouse built in the backyard. This large space holds more furniture and features hinged doors that open and provide shade for the patio during the day. To reduce energy use, the building uses LED lighting and was structured to encourage natural ventilation for cooling. Rainwater harvested from the roof is used to irrigate the lush landscape, which was designed by SAPU. 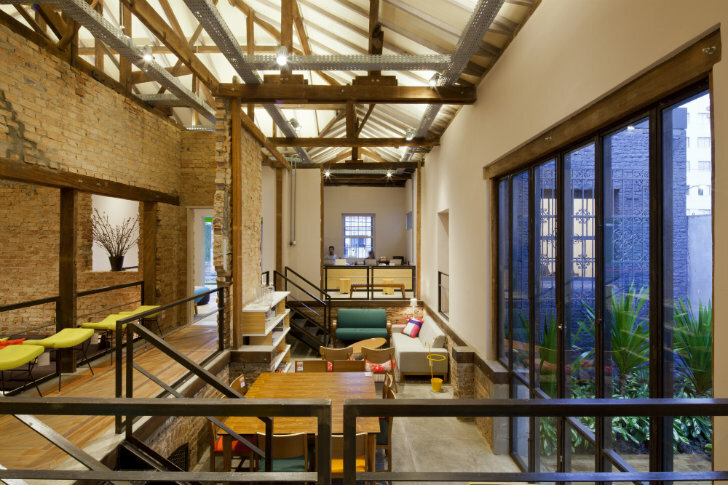 SuperLimão designed the space to make it suitable as a retail shop, without compromising the history or character of the site. Brazilian furniture designer, Fernando Jaeger creates modern, functional pieces using local materials and reforested wood out of São Paulo. His newest store in Pompeii offers ready-to-ship items in a cheerful spot created out of an old home where two sisters used to live. When they sold their home to Jaeger, they made him promise not to change the architecture of the home and not to cut down the beautiful jaboticaba tree. The brick home featured unique arcs, large windows and wood frame work, which were retained and highlighted in the new design. Roof tiles were reused when the roof was reconstructed, the original floor was kept and some floor beams were used as columns to support the roof and open up some of the rooms. Any brick taken out was reused in the new warehouse built in the back yard. This large space holds more furniture and features hinged doors that open and provide shade for the patio during the day. To reduce energy use, the building was structured to encourage natural ventilation for cooling. Rainwater harvested from the roof is used to irrigate the lush landscape, which was designed by SAPU. The courtyard showcases outdoor furniture and leads to the warehouse. The Pompeii FJ store is a mix of old and new and a perfect place to show off the furniture. Floor plan of the FJ store.